Strategy execution starts with clarifying the Vision, so that key stakeholders develop a clear understanding of where the organisation is today, compared to where it wants to be. A Roadmap then needs to be developed to identify how the organisation will get from the current state, to the desired future state. An appropriate Governance structure needs to be established, to enable fast, credible decision-making, and to ensure that the individual initiatives, as well as the overall strategy, remain on track. Delivery is concerned with the activities undertaken to achieve the required outcomes. These may include a combination of formal programs and projects, or less formal smaller initiatives and business-as-usual activities. As Outcomes are achieved, they need to be tracked, reported and evaluated against the original strategic objectives. The original strategic objectives also need to be reviewed in order to take into account real-world learnings. 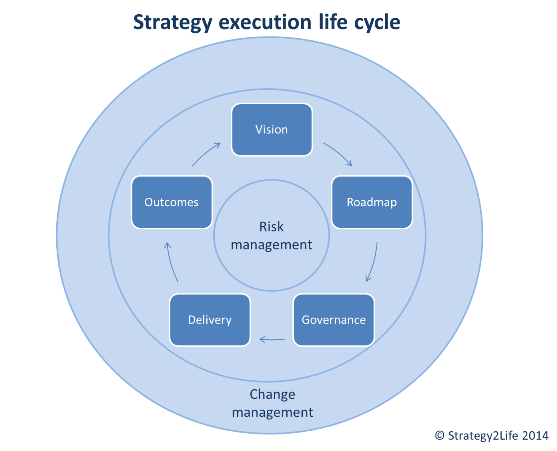 Central to the execution process is Risk Management on an ongoing basis, as the nature and level of risk in the organisation will change, both during, and resulting from, strategy execution. There needs to be Change Management throughout the strategy execution process, as there will be a continuing need to build and maintain support for the change among key stakeholders, and also to equip stakeholders with the means and capability to transition to the desired future state.